Original Release Notes: "Keep It In Motion" is a propulsive, drum-machine driven pop song which features, unusually, acoustic guitars, strings, and Robert Pollard / Tobin Sprout singing together in a way not heard since "14 Cheerleader Coldfront" on 1992's Propeller. Possibly. Bob recorded and sent to Toby at his home studio in Michigan for over-dubbing. The B-Sides consist of "Pink Wings," a lo-fi snippet on which Pollard speak-sings scary lyrics about wings full of blood over a bed of Beatle-esque harmonies, not entirely unlike Alien Lanes' "Chicken Blows," and "White World," an actual Beatle-esque pop song with horns (or at least horn samples) and a Pixies-like bass intro. Press release that incorrectly mentions it as a non-album single (it is on the album): "Pink Vinyl Single. 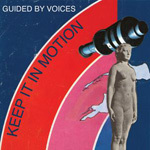 "Keep it in Motion" is the new non-album single from Guided by Voices. Following the blow-away success of the album 'Let's Go Eat the Factory', the first to be recorded with the 'classic line-up' for fifteen years, GBV continue to make music together that's every bit as good as they were in the old days (if not better!). "Keep it in Motion" is a song with the sort of driving quality and repetition aligned with a ridiculously catchy-melody, to make it a sure-fire hit! // "Sweetly touching brain pop... playground psychedelia at its most brilliant and uplifting." **** 4 Stars � Mojo // "A kaleidoscopic burst of ideas and passion and absurdity." 4 Stars - The Guardian // "Re-formed underground legends return at full pelt." **** 4 Stars - Q Magazine // "A glorious, frayed-at-the-edges patchwork of bristling garage pop, stadium rock racketeering, saloon-bar tenderness, and nightmarishly ramshackle dirges." 8/10 � NME // Tracks : 1. Keep It In Motion 2. White World 3. Pink Wings"
One of three singles planned to be released for the 2nd GBV album of 2012, Class Clown Spots A UFO. Original release date was going to be 2/21/12 but it was bumped back due to the success of Let's Go Eat The Factory.